You spend a lot of time at work, so where you work needs to be a great place for you. At Faraday House we've tried to make the perfect environment for both your business and for you. As well as newly decorated offices and facilities we have relaxing break out areas for informal meetings, to catch up, or just relax. Faraday House has a lovely garden, which we can all enjoy. We’ve installed new showers and bike parking so if you cycle, run or walk you can change in comfort. And, we are a great community; businesses and charities working and thriving together, helping each other, creating great ideas for the benefit of all. Faraday House is a fully accessible and DDA compliant venue with no step access across the entire site. We provide accessible parking and toilet facilities as well as height adjustable workstations and kitchen facilities. Our meeting rooms are designed for everyone including; hearing loop systems, LED lighting to reduce photosensitive epilepsy, signage for the visually impaired and audible / visual fire alert systems. Our accessible garden has lovely raised beds and is fitted with access trackway throughout. We are a Dementia Friendly Venue and have staff and volunteer Dementia Friends on site. Faraday House is a social enterprise run by the charity Age UK East Sussex. We have designed our facilities to provide the best services for businesses, community groups, charities and the public sector. As well as being affordable any surplus income from Faraday House stays within the voluntary sector; supporting and furthering work within the local community. 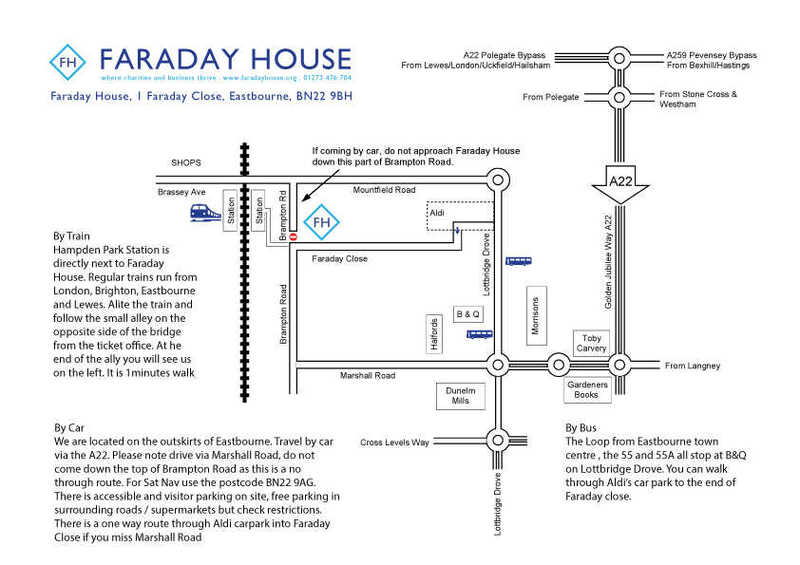 Faraday House is a professional business centre based in Eastbourne, East Sussex. We provide high quality, affordable, facilities for Voluntary and Community Groups and Business Partners to use on a day-to-day or long term basis. Faraday house is a progressive environment where like-minded organisations can work and thrive together. Our aim is to help you take the hassle out of finding a great place to work so you can concentrate on your success.